"This is where it began". Field recordings, drones and found objects. 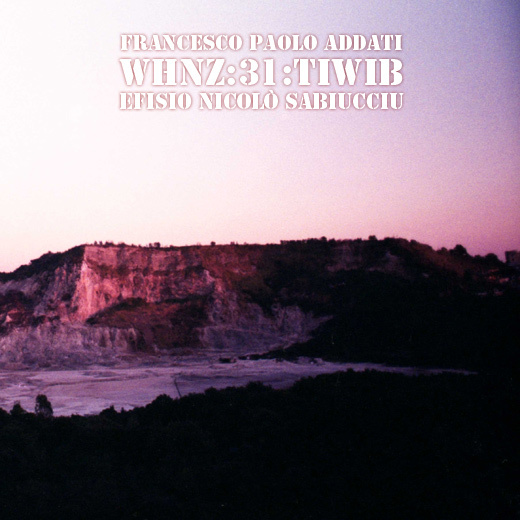 TIWIB is an audiovisual project by Francesco Paolo Addati (sound), already tenor sax player in a band called "Ne Travaillez Jamais" and Efisio Nicolò Sabiucciu (video) from "Samples Lab". A part of "River Of Blood" features Eugenio Altieri. Recorded in Naples between March and September 2011. The album soon ought to be released in 50 copies (CD+DVD) for Naples' Fallo Dischi. Francesco Paolo Addati is an Italian musician based In Naples. Since he was child he developed an incredible passion for music and sounds. In the beginning of 2006 with a friend Luca he st up a band called "Filocalia", a dub musical project where he played tenor sax, synths and sampler; with Filocalia Francesco made an album and gigs around Italy. In 2008 he met the prog-punk collective "Ne Travaillez Jamais", where at the moment he's the sax and synth player. They play around Italy and in Naples sharing passion and spirituality, and touring with the NY band Talibam!. In the summer of 2010 Francesco starts to collect field recordings and study drone sounds using synths and samples. In the beginning of 2011 this research became a specific solo project composed of 5 audio/video tracks called "This Is Where It Began" in collaboration with the visual artist Efisio Nicolò Sabiucciu. Efsio Nicolò Sabiucciu, Torre del Greco 1986, grew up surrounded by acrilic and oil paints since the beginning of his life, developing a strong passion for drawings and arts. 2006 he enrolled on a study course in Industrial Design at the Second University of Naples and set up and developed, with his study team, the audio/visual collective "SAMPLES LAB". They started to work actively in Naples on planning and implementing video installations and graphic concepts. Prototyping common life objects, they experimented in different ways to transform video into a materialization of mind. 2011 started to collaborate with Francesco Paolo Addati for the project "This Is Where It Began".